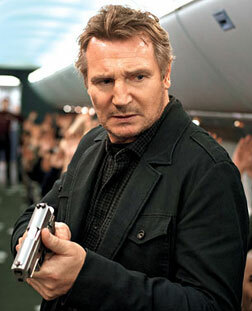 Bill Marks (Liam Neeson) is an air marshall. He is also scared of take-offs, rude, and inexplicably able to convince people of his veracity despite overwhelming odds. For, in Non-Stop, a film about the perils of nonstop flights from New York to London, these odds are supplied more by Bill's neurotic penchant for beating people to a pulp than from the film's geeky villain. As far as the villain is concerned, all he wants is 150 million bucks deposited into Bill's account so that everyone can get off of the plane safely. The process is simple - once every 20 minutes, somebody dies, unless the money gets into the account. All of this is being relayed to Bill via text messages on his secure mobile network by someone on the flight. The first person to die is Marks' co-air marshall Jack Hammond (Anson Mount - we do feel that his desire to die first might have something to do with the shame of living with that name), who is on the flight as Marks' backup, in case the latter gives in to his neurotic, alcoholic ways. And see how well that ends. The next to go is the pilot, at which point the passengers finally start worrying about what the freakin' freak is happening on board! Fingers are pointed unanimously at Bill, because, you know, of the whole fact that he first went after the blacks and the Asians when time came to weed out the suspects. Way to go with creating empathy for your hero, director. Bill, however, manages to subdue them with his charisma and a sob story, but mostly the latter, and manages to bully a geek into creating a hack for discovering the villain's mobile, leading to yet another death at the third 20-minute mark. The thing about all these deaths is that they occur while Marks is in the process of thrashing the living daylights out of the victims. He didn't kill them, which doesn't take away from the fact that, for some mysterious reason, the people (including those who've been displaced from their cushy business class seats and forced to fraternise with the hoi polloi) didn't mob up on him. Other mysteries include why exactly the plane couldn't have turned back, why the Jen Summers (Jullainne Moore) turns up everywhere in a suspiciously freakish manner, why Bill Marks hasn't been forced to retire, why he couldn't just have interrogated the passengers nicely about who was using the cell phone around them, and so on and so forth. While you don't get answers to any of these burning questions, the answer you do get to the main whodunit plot will make you seek out the nearest wall and bash your head on it with all the joy of Liam Neeson's fist meeting some hapless moron's face. However, for all its utter implausibility, the movie is pretty exciting throughout. First, there is the fact that despite the destruction of several cellphones, the mysterious villain keeps finding ways to text Bill, going so far as to assert that "there is only one way to stop this". We don't know if this was intentional, but the whole idea does bring to mind how utterly insidiously the cell phone has permeated the fabric of our lives, just like the blue liquid in a sanitary napkin ad. Also, the mystery is kept intact up until the very end, but that might have something to do with the fact that the climax is so out of place that it might as well have been from a different movie. Lastly, but nevertheless more importantly, Liam Neeson can always be counted on to make you wish to brush up on your boxing skills. He has so much fun turning various people into pulp that he barely notices the ridiculous movie he is in. Everyone else in the cast seems somewhat aware, or at least wishful, that the whole thing is a joke. 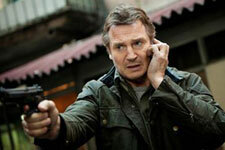 But not Neeson. It is almost endearing how immersed he is in his character. Jullainne Moore doesn't have much to do except show up at odd times and look prettily creepy. The rest of the cast comes straight from the stock character factory catalog, from which the director must have ordered the following - one black hipster, one French flirt, one British stiff-neck, and one Arab man in a kurta and a cap, amongst others. For all the chaos of the plot, the cinematography is excellently focused. The text messages popping up on the screen is an inspired way to find out what's happening without constantly focusing on the mobile phone screen. Also, they look great. The whole thing looks extremely polished, and just the right amount of shiftiness is applied to make the whole thing look like the inside of Bill's diseased mind. The music works well in tandem with the screenplay to up the tension as and when required. All in all, you can watch Non-Stop about three-fourth times and really enjoy it. Anything more than that is overload. Be the first to comment on Non-Stop! Just use the simple form below. fullhyd.com has 700,000+ monthly visits. Tell Hyderabad what you feel about Non-Stop!